‘Fire Ant’ is a general term for nearly three hundred species of stinging red ants in the Solenopsis genus that are common around the world. Fire ants range from one eighth of an inch to one quarter of an inch and should not be confused with the significantly larger velvet ants (one to two inches). The winged ants in the colony are the ants able to reproduce. The ants are known for being significantly more aggressive than other ant species and for having a strong painful sting that leaves a white pustule due to the venom in the ants’ sting. Fire ants are considered pests both because of their sting and because of their ability to harm plants, crops, and small animals. Fire ants are omnivores and feed on a wide range of plants animals. They have strong mandibles and along with their stings are capable of killing animals much larger than they are and carrying them back to their colony. As a group, fire ants can kill animals as large as small mammals. Fire ants are the most dangerous when an animal, including a human, steps on their mound. Pheromones from the crushed ants cause nearby ants to go into a frenzied ‘attack mode’ in which hundreds of ants crawl up the invader’s leg and simultaneously bite them. This concerted attack leaves behind enough venom to kill small animals. Human deaths from fire ant bites are exceedingly rare. Fire ants are known for their ability to invade a new area extremely quickly. People have been known to see mounds appear in their yards seemingly overnight. The ants are extremely resilient and can survive temperatures well below freezing. While workers tend to live for only four to six weeks, a queen fire ant can live as long as seven years. In addition, fire ants have evolved truly unique survival techniques. For instance, if the ants detect a flood by feeling water in their mound, the colony will swarm together and create a ‘ball’ of ants that is able to float. The queen and other important members are placed in the middle of the ball which then floats over the water until it hits a tall stationary object. Once it does, the ants swarm onto it and wait for the water to recede. Fire ants can be extreme nuisances. In the United States alone, billions of dollars are spent each year on eradicating fire ants, damage control, and medically related issues caused by the ants. In addition, fire ants case hundreds of millions of dollars of damage to agricultural crops every year. Fire ants are very sensitive to dangers to their colonies. 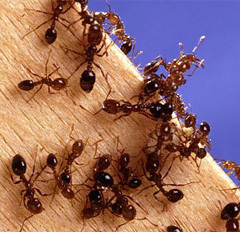 Many methods for getting rid of fire ants, especially ‘home remedies,’ will kill a number of the ants but not the queen and will simply result in the relocation of the colony.